Healthy soil is the foundation of all life on Earth. Soil erosion is a "silent global crisis" that's undermining food production and water availability. 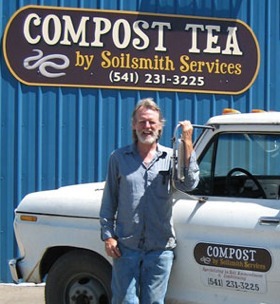 Based near Philomath and Corvallis in the Willamette Valley of Oregon, Soilsmith Services provides beneficial services and products to both commercial and residential clients throughout the USA using sustainable growing methods that result in improved soil biology, plant vigor, and overall health. When a plant grows without undo stress, it's able to produce all of the biological and chemical processes necessary for optimum growth. Creating these conditions results in diminished stress caused by weather (abiotic) and insects/disease (biotic) and an improved ability to withstand these negative impacts. To realize the benefits of good soil practices, we provide instructive knowledge and advice, make on-site visits to evaluate residential and commercial land, test soil samples, interpret results, and design seasonal programs specific to unique needs. We assist farmers, growers, and nurseries to reduce dependence on chemical inputs. Disease and insect pressures are lessened; soil structure, plant vigor, and mineralization improves. We produce, deliver, and apply compost tea, compost, screened compost, and McKenzie Glacial Rock Flour. Compost tea is a water extract of high quality thermal compost where beneficial microorganisms grow to exponential numbers during a 24-hour "brewing" process. These organisms make up a large part of the soil's complex. Improved mineralization and water uptake by roots is enhanced. Shepard Smith, founder of Soilsmith Services, also makes public presentations and conducts workshops. Read an interview with Shepard Smith conducted by Dan Armstrong of Mud City Press in June 2010. Feed the soil! See an 8-minute video about making compost with Shepard Smith of Soilsmith Services.